Despite the lack of action around this blog, there’s been a decent amount of knitting and spinning and a whole lot of action on the home front. Blame this all on the fact that we’ve been looking at houses. We haven’t found anything perfect yet, but we’re still truckin’. There was one that seemed ideal for a moment, but it wasn’t meant to be. I also had a lovely little vacation with a guest from out of town, including Webs shopping, BBQ-eating, banjo-band-listening, and a trip to the Museum of Fine Arts. Does it get any better than that? Only if the visit is longer. I should probably show you my current big project before it’s finished, huh? This sweater is a total experiment. I usually like to have an idea if something is going to look okay on me before I start it, but I’ve thrown caution to the wind on this one and am just going with its glorious 70s smockness. Will it be too dorky? I do not know. Let’s hope the yarn’s beauty keeps it on the awesome side. If not, you’ll hear all about it. The yarn is Taiyo (colorway #4), the 40% cotton, 30% silk, and 15% each wool and nylon big fat papery Kureyon-looking, yet summery, yarn from Noro. The fabric is light and bouncy at the loose gauge I’m using. The colors are insane. The knitting is fast. I should be wearing it, weather permitting, within the week. There are more projects coming: another handspun Anne scarf, a handspun naturally-colored striped vest for Mr. HelloYarn (Totally not copying yoohoo, in fact, he copied me. Yeah, that’s it. ), and who knows what else that’s buried in my knitting basket! PS: As you might have noticed, I’m a ton better at keeping things up to date over on Flickr so, if you miss me, you can always find me there. 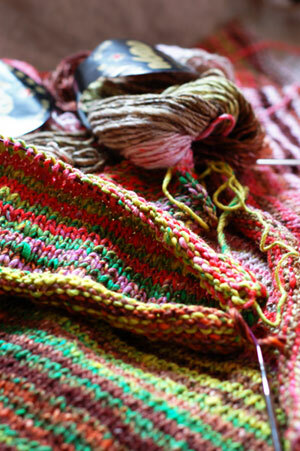 The progress shots of the Taiyo sweater are so fabulous…I can’t wait to see what the finished piece looks like! I’ve been a lot better about keeping up at Flickr these days, too. I love how that sweater is coming out! 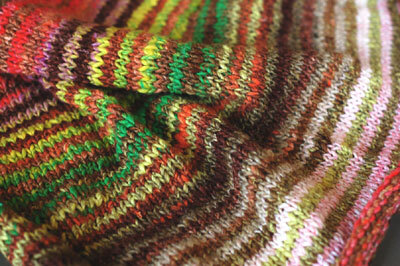 I am getting lots of handspun stripey ideas! Can’t wait to see it finished! Vertical stripes are awesome. Isn’t that the best yarn and the best colorway? I made a Chameleon Scarf out of it and it is awesome! The colors are wonderful together. I know what you mean about the blogging – it’s so much easier to knit than post about it! It doesn’t look smock-like at all, especially because of the vertical stripes. Those are some really nice colors, too! I can not WAIT to see your F.O. post with all your details for your sweater. Those colors are terrific! I can’t wait to see it finished. this is one happy sweater. and the book is the best. i love it. i was so amazed by the price it goes for now having had it since it was published. it is really too bad that all the lovely technique oriented books end up being so ridiculously expensive. 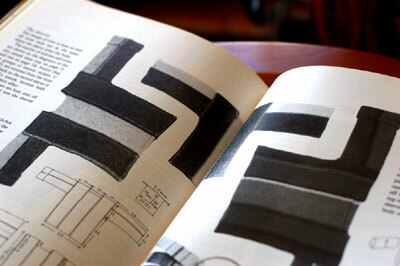 you should see the knitting books published in danish these days. it is such a waste of paper. God, that’s gorgeous! I love the colours.